The number of people searching online for "Time Travel" - and research done on the topic - is increasing with some of the evidence presented credible - the rest leaving much to to be desired. 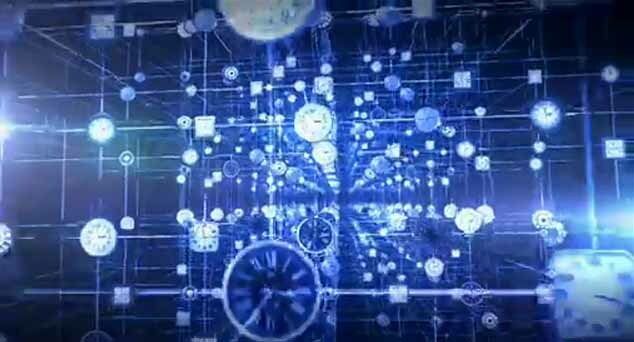 Time travel can be physical and spiritual in the sense of consciousness traveling between grids of reality. Time travel is the concept of movement (such as by a human) between certain points in time, analogous to movement between different points in space, typically using a hypothetical device known as a time machine, in the form of a vehicle or of a portal connecting distant points in time. Time travel is a recognized concept in philosophy and fiction, but traveling to an arbitrary point in time has a very limited support in theoretical physics, and usually only in conjunction with quantum mechanics or Einstein-Rosen bridges. In a more narrow sense, one-way time travel into the future via time dilation is a proven phenomenon in relativistic physics, but traveling any significant "distance" requires motion at speeds close to the speed of light, which is not feasible for human travel with current technology. The concept was touched upon in various earlier works of fiction, but was popularized by H. G. Wells' 1895 novel The Time Machine, which moved the concept of time travel into the public imagination, and it remains a popular subject in science fiction. 1819 Ð Washington Irving's "Rip Van Winkle"
1824 Ð Faddey Bulgarin's "Pravdopodobnie Nebylitsi"
There is no widespread agreement as to which written work should be recognized as the earliest example of a time travel story, since a number of early works feature elements ambiguously suggestive of time travel. This means that an observer entering the accelerated end would exit the stationary end when the stationary end was the same age that the accelerated end had been at the moment before entry; for example, if prior to entering the wormhole the observer noted that a clock at the accelerated end read a date of 2007 while a clock at the stationary end read 2012, then the observer would exit the stationary end when its clock also read 2007, a trip backwards in time as seen by other observers outside. One significant limitation of such a time machine is that it is only possible to go as far back in time as the initial creation of the machine; in essence, it is more of a path through time than it is a device that itself moves through time, and it would not allow the technology itself to be moved backwards in time. This could provide an alternative explanation for Hawking's observation: a time machine will be built someday, but has not yet been built, so the tourists from the future cannot reach this far back in time. According to current theories on the nature of wormholes, construction of a traversable wormhole would require the existence of a substance with negative energy (often referred to as "exotic matter") . 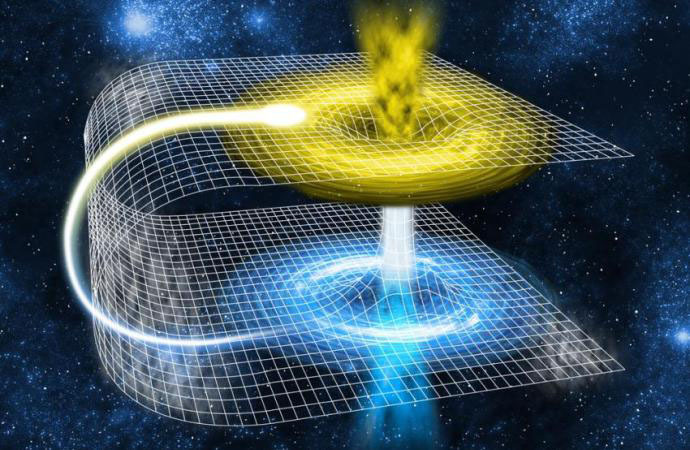 More technically, the wormhole spacetime requires a distribution of energy that violates various energy conditions, such as the null energy condition along with the weak, strong, and dominant energy conditions. 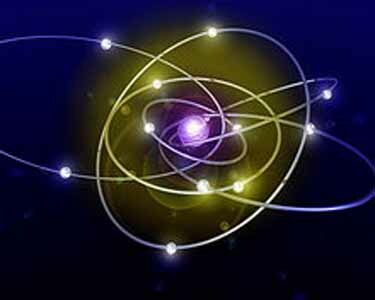 However, it is known that quantum effects can lead to small measurable violations of the null energy condition, and many physicists believe that the required negative energy may actually be possible due to the Casimir effect in quantum physics. Although early calculations suggested a very large amount of negative energy would be required, later calculations showed that the amount of negative energy can be made arbitrarily small. In 1993, Matt Visser argued that the two mouths of a wormhole with such an induced clock difference could not be brought together without inducing quantum field and gravitational effects that would either make the wormhole collapse or the two mouths repel each other. Because of this, the two mouths could not be brought close enough for causality violation to take place. However, in a 1997 paper, Visser hypothesized that a complex "Roman ring" (named after Tom Roman) configuration of an N number of wormholes arranged in a symmetric polygon could still act as a time machine, although he concludes that this is more likely a flaw in classical quantum gravity theory rather than proof that causality violation is possible. If one were able to move information or matter from one point to another faster than light, then according to special relativity, there would be some inertial frame of reference in which the signal or object was moving backward in time. This is a consequence of the relativity of simultaneity in special relativity, which says that in some cases different reference frames will disagree on whether two events at different locations happened "at the same time" or not, and they can also disagree on the order of the two events (technically, these disagreements occur when the spacetime interval between the events is 'space-like', meaning that neither event lies in the future light cone of the other). If one of the two events represents the sending of a signal from one location and the second event represents the reception of the same signal at another location, then as long as the signal is moving at the speed of light or slower, the mathematics of simultaneity ensures that all reference frames agree that the transmission-event happened before the reception-event. However, in the case of a hypothetical signal moving faster than light, there would always be some frames in which the signal was received before it was sent, so that the signal could be said to have moved backwards in time. And since one of the two fundamental postulates of special relativity says that the laws of physics should work the same way in every inertial frame, then if it is possible for signals to move backwards in time in any one frame, it must be possible in all frames. This means that if observer A sends a signal to observer B which moves FTL (faster than light) in A's frame but backwards in time in B's frame, and then B sends a reply which moves FTL in B's frame but backwards in time in A's frame, it could work out that A receives the reply before sending the original signal, a clear violation of causality in every frame. An illustration of such a scenario using spacetime diagrams can be found here. According to special relativity, it would take an infinite amount of energy to accelerate a slower-than-light object to the speed of light. Although relativity does not forbid the theoretical possibility of tachyons which move faster than light at all times, when analyzed using quantum field theory, it seems that it would not actually be possible to use them to transmit information faster than light, and that there is no evidence for their existence. Some theories, most notably special and general relativity, suggest that suitable geometries of spacetime, or specific types of motion in space, might allow time travel into the past and future if these geometries or motions are possible. In technical papers, physicists generally avoid the commonplace language of "moving" or "traveling" through time ('movement' normally refers only to a change in spatial position as the time coordinate is varied), and instead discuss the possibility of closed timelike curves, which are worldlines that form closed loops in spacetime, allowing objects to return to their own past. There are known to be solutions to the equations of general relativity that describe space-times which contain closed timelike curves (such as Godel spacetime), but the physical plausibility of these solutions is uncertain. Relativity states that if one were to move away from the Earth at relativistic velocities and return, more time would have passed on Earth than for the traveler, so in this sense it is accepted that relativity allows "travel into the future". According to relativity there is no single objective answer to how much time has 'really' passed between the departure and the return, but there is an objective answer to how much proper time has been experienced by both the Earth and the traveler, i.e. how much each has aged. On the other hand, many in the scientific community believe that backwards time travel is highly unlikely. Any theory which would allow time travel would require that problems of causality be resolved. The classic example of a problem involving causality is the "grandfather paradox": what if one were to go back in time and kill one's own grandfather before one's father was conceived? But some scientists believe that paradoxes can be avoided, either by appealing to the Novikov self-consistency principle or to the notion of branching parallel universes. Hawking notes elsewhere that time travel might only be possible in a region of spacetime that is warped in the correct way, and that if we cannot create such a region until the future, then time travelers would not be able to travel back before that date, so "This picture would explain why we haven't been over run by tourists from the future." Carl Sagan also once suggested the possibility that time travelers could be here, but are disguising their existence or are not recognized as time travelers. First of all, if one is able to move information from one point to another faster than light, then according to special relativity, there will be an observer who sees this information transfer as allowing information to travel into the past. The General Theory of Relativity extends the Special Theory to cover gravity. It does this by postulating that matter "curves" the space in its vicinity. But under relativity, properties of space are fairly interchangeable with properties of time, depending on one's perspective, so that a curved path through space can wind up being a curved path through time. In moderate degrees, this allows two straight lines of different length to connect the same points in space; in extreme degrees, theoretically, it could allow timelines to curve around in a circle and reconnect with their own past. General relativity describes the universe under a complex system of "field equations," and there exist solutions to these equations that permit what are called "closed time-like curves," and hence time travel into the past. The first and most famous of these was proposed by Kurt Godel, but all known current examples require the universe to have physical characteristics that it does not appear to have. Whether general relativity forbids closed time-like curves for all realistic conditions is unknown. Most physicists believe that it does, largely because assuming some principle against time travel prevents paradoxical situations from occurring. A proposed time-travel machine using a wormhole would (hypothetically) work something like this: A wormhole is created somehow. 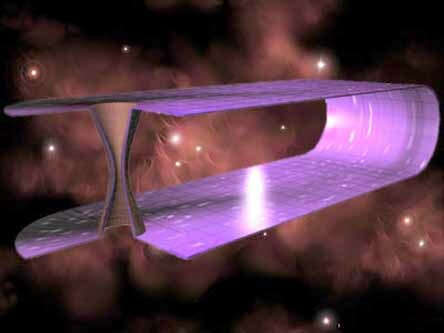 One end of the wormhole is accelerated to nearly the speed of light, perhaps with an advanced spaceship, and then brought back to the point of origin. Due to time dilation, the accelerated end of the wormhole has now experienced less subjective passage of time than the stationary end. An object that goes into the stationary end would come out of the other end in the past relative to the time when it enters. One significant limitation of such a time machine is that it is only possible to go as far back in time as the initial creation of the machine; in essence, it is more of a path through time than it is a device that itself moves through time, and it would not allow the technology itself to be moved backwards in time. This could provide an alternative explanation for Hawking's observation: a time machine will be built someday, but hasn't been built yet, so the tourists from the future can't reach this far back in time. Creating a wormhole of a size useful for macroscopic spacecraft, keeping it stable, and moving one end of it around would require significant energy, many orders of magnitude more than the Sun can produce in its lifetime. Construction of a wormhole would also require the existence of a substance known as "exotic matter," or "negative matter", which, while not known to be impossible, is also not known to exist in forms useful for wormhole construction (but see for example the Casimir effect). Therefore it is unlikely such a device will ever be constructed, even with highly advanced technology. 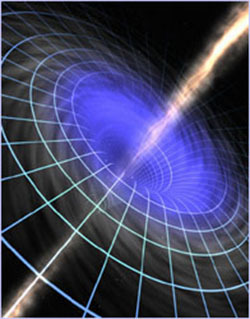 On the other hand, microscopic wormholes could still be useful for sending information back in time.Matt Visser argued in 1993 that the two mouths of a wormhole with such an induced clock difference could not be brought together without inducing quantum field and gravitational effects that would either make the wormhole collapse or the two mouths repel each other. Because of this, the two mouths could not be brought close enough for causality violation to take place. However, in a 1997 paper, Visser hypothesized that a complex "Roman ring" (named after Tom Roman) configuration of an N number of wormholes arranged in a symmetric polygon could still act as a time machine, although he concludes that this is more likely than not a flaw in classical quantum gravity theory rather than proof that causality violation is possible. Another approach, developed by Frank Tipler, involves a spinning cylinder. If a cylinder is long, and dense, and spins fast enough about its long axis, then a spaceship flying around the cylinder on a spiral path could travel back in time (or forward, depending on the direction of its spiral). However, the density and speed required is so great that ordinary matter is not strong enough to construct it. A similar device might be built from a cosmic string, but none are known to exist, and it doesn't seem to be possible to create a new cosmic string. Physicist Robert Forward noted that a naive application of general relativity to quantum mechanics suggests another way to build a time machine. A heavy atomic nucleus in a strong magnetic field would elongate into a cylinder, whose density and "spin" are enough to build a time machine. Gamma rays projected at it might allow information (not matter) to be sent back in time. However, he pointed out that until we have a single theory combining relativity and quantum mechanics, we will have no idea whether such speculations are nonsense. Quantum mechanical phenomena such as quantum teleportation, the EPR paradox, or quantum entanglement might appear to create a mechanism that allows for faster-than-light (FTL) communication or time travel, and in fact some interpretations of quantum mechanics such as the Bohm interpretation presumes that some information is being exchanged between particles instantaneously in order to maintain correlations between particles. This effect was referred to as "spooky action at a distance" by Einstein. Nevertheless, the rules of quantum mechanics curiously appear to prevent an outsider from using these methods to actually transmit useful information, and therefore do not appear to allow for time travel or FTL communication. This misunderstanding seems to be widespread in popular press coverage of quantum teleportation experiments. The assumption that time travel or superluminal communications is impossible allows one to derive interesting results such as the no cloning theorem, and how the rules of quantum mechanics work to preserve causality is an active area of research. The Novikov self-consistency principle and recent calculations by Kip S. Thorne indicate that simple masses passing through time travel wormholes could never engender paradoxes - there are no initial conditions that lead to paradox once time travel is introduced. If his results can be generalized they would suggest, curiously, that none of the supposed paradoxes formulated in time travel stories can actually be formulated at a precise physical level: that is, that any situation you can set up in a time travel story turns out to permit many consistent solutions. The circumstances might, however, turn out to be almost unbelievably strange. Parallel universes might provide a way out of paradoxes. Everett's many-worlds interpretation of quantum mechanics suggests that all possible quantum events can occur in mutually exclusive histories. These alternate, or parallel histories would form a branching tree symbolizing all possible outcomes of any interaction. Since all possibilities exist, any paradoxes can be explained by having the paradoxical events happening in a different universe. This concept is most often used in science-fiction. However, in actuality, physicists believe that such interaction or interference between these histories is not possible. It has been suggested by physicists such as Max Tegmark that the absence of time travel and the existence of causality may be due to the anthropic principle. The argument is that a universe which allows for time travel and closed time-like loops is one in which intelligence could not evolve because it would be impossible for a being to sort events into a past and future or to make predictions or comprehend the world around them. Note that this imposes no restriction on supernatural agents (e.g. God) which are not confined by the bounds of spacetime. It is interesting to note that any religion which postulates the existence of fulfilled prophecy requires, at the very least, an agent which can move information from the future into the past. In Christian theology, for example, God is assumed to exist unbound by space or time. Doctrinally, God is held to be omniscient and omnipresent. Statements in the Bible such as Jesus's claim "before Abraham was born, I am" (John 8:58) and Peter's claim "[Jesus] was chosen before the creation of the world" (1 Peter 1:20) (assuming the creation of the world began at t = 0) imply that God does not occupy the same timeline that we do. This is further supported by the assertion "I the LORD do not change" (Malachi 3:6), since change requires movement along, and constrained by, a temporal continuum. Two popular interpretations of these statements are that God exists outside the space-time continuum; or exists at every point in space-time simultaneously. In either case, God can transfer information from one point in space-time to any other point without restriction. The Yoga Sutras of Patanjali have been considered by some, such as physicist Fred Alan Wolf in his book, The Yoga of Time Travel to describe an inner process by which we can access knowledge of the past and future in the present. This form of time travel can be acquired by transcending the five Earthly anchors of the ego mind which otherwise leave us locked into the illusory self. H. G. Wells' The Time Machine is considered the literary masterpiece of the genre. Mark Twain's A Connecticut Yankee in King Arthur's Court is another early time travel classic. Probably the most elaborate demonstrations of supposed time travel paradoxes are in Robert A. Heinlein's All You Zombies and By His Bootstraps. One very well known time travel fiction writer is Jack Finney. His novels include Time and Again, From Time to Time, The Third Level, among others. Harry Potter and the Prisoner of Azkaban by J. K. Rowling features a time travel paradox as does the film version. Michael Crichton's Timeline, in which characters travel to 14th century France, describes time travel in great detail, explaining the science of exactly how the time machine works. The book was made into a movie in 2004, with much of the science explanation missing. Part 1 explains that we exist in a hologram. Part 2 explains the illusion of time. Researchers from the Moscow Institute of Physics and Technology teamed up with colleagues from the U.S. and Switzerland and returned the state of a quantum computer a fraction of a second into the past. They also calculated the probability that an electron in empty interstellar space will spontaneously travel back into its recent past. As the common tropes of science fiction continue to break out into reality, from humanoid robots to self-driving cars, thereÕs one concept that has seemingly remained beyond our grasp: time travel. But, jumping through time might not be impossible, after all, according to one astrophysicist. By the rules of theoretical physics, certain conditions exist that would allow for the construction of elaborate wormholes, which could transport humans back to different eras. A wormhole could be constructed in a way that allows one end to remain nearly motionless, while the other moves at almost the speed of light. This could theoretically allow humans to travel through time. 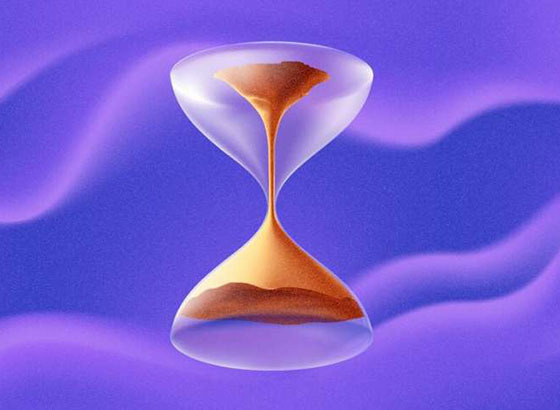 The study of closed timelike curves (CTC's) provides valuable insight into particles that can loop back on themselves, breaking free of linear time. According to Einstein's Special Relativity Theory, time is affected by speed and gravity. The concept of a time machine typically conjures up images of an implausible plot device used in a few too many science-fiction storylines. But according to Albert Einstein's general theory of relativity, which explains how gravity operates in the universe, real-life time travel isn't just a vague fantasy. The concept of a time machine typically conjures up images of an implausible plot device used in a few too many science-fiction storylines. But according to Albert Einstein's general theory of relativity, which explains how gravity operates in the universe, real-life time travel isn't just a vague fantasy. Traveling forward in time is an uncontroversial possibility, according to Einstein's theory. In fact, physicists have been able to send tiny particles called muons, which are similar to electrons, forward in time by manipulating the gravity around them. That's not to say the technology for sending humans 100 years into the future will be available anytime soon, though. 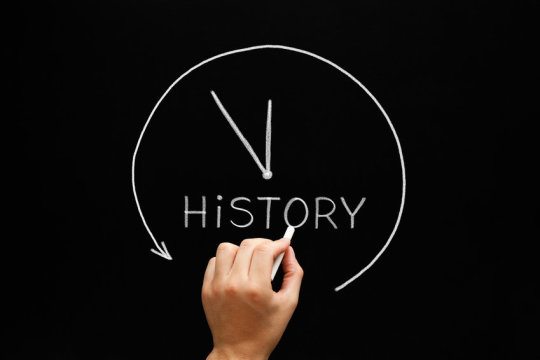 Time travel to the past, however, is even less understood. Still, astrophysicist Eric W. Davis argues that it's possible. All you need, he says, is a wormhole, which is a theoretical passageway through space-time that is predicted by relativity. Researchers from Cornell University in Ithaca, N.Y., have demonstrated for the first time that it's possible to cloak a singular event in time, creating what has been described as a "history editor." In a feat of Einstein-inspired physics, Moti Fridman and his colleagues sent a beam of light traveling down an optical fiber and through a pair of so-called "time lenses." Between these two lenses, the researchers were able to briefly create a small bubble, or gap, in the flow of light. During that fleetingly brief moment, lasting only the tiniest fraction of a second, the gap functioned like a temporal hole, concealing the fact that a brief burst of light ever occurred. If subatomic particles called neutrinos can go faster than the speed of light, it would require a rethinking of the basics of physics, including the possibility of time travel. The news that particles called neutrinos may travel faster than light has been met with shock, skepticism and excitement from physicists around the world. Puzzling results from Cern, home of the LHC, have confounded physicists - because it appears subatomic particles have exceeded the speed of light. Neutrinos sent through the ground from Cern toward the Gran Sasso laboratory in Italy, 732km away, seemed to show up a tiny fraction of a second early. The result - which threatens to upend a century of physics - will be put online for scrutiny by other scientists. In the meantime, the group says it is being very cautious about its claims. 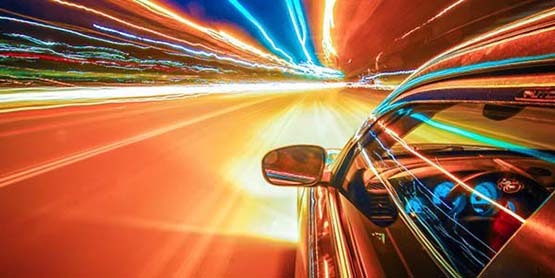 Physicists have confirmed the ultimate speed limit for the packets of light called photons - making time travel even less likely than thought. By observing the way that light moves inside a metamaterial, researchers have reconstructed how spacetime has expanded since the Big Bang. The results provide a better understanding of why time moves in only one direction, and also suggest that time travel is impossible. The possibility of going back in time only to kill your ancestors and prevent your own birth has posed a serious problem for potential time travelers, not even considering the technical details of building a time machine. But a new theory proposed by physicists at MIT suggests that this grandfather paradox could be avoided by using quantum teleportation and "post-selecting" what a time traveler could and could not do. So while murdering one's relatives is unfortunately possible in the present time, such actions would be strictly forbidden if you were to try them during a trip to the past. Scientists have come up with the radical suggestion that the universe's end may come not with a bang but a standstill - that time could be literally running out and could, one day, stop altogether. In The Matrix, the hero Neo could dodge bullets because time moved in slow motion for him during battles. Indeed, in the real world, people in danger often feel as if time slowed down for them. This warping of time apparently does not result from the brain speeding up from adrenaline when in danger. Instead, this feeling seems to be an illusion, scientists now find. To see if danger makes people experience time in slow motion, scientists at Baylor College of Medicine in Houston tried scaring volunteers. However, roller coasters and other frightening amusement park rides did not cause enough fear to make time warp. The basic premise of this day is to pretend to be a time traveler, either from the past or future, who has somehow ended up in present day. Science fiction presents opportunities to physically time travel with warnings about tampering with timelines. I have physically met people who claim to be from the future having traveled - or been sent back to this timeline - to warn us about whatever. This is sometimes associated with science, extraterrestrials, mental illness, or substance abuse. 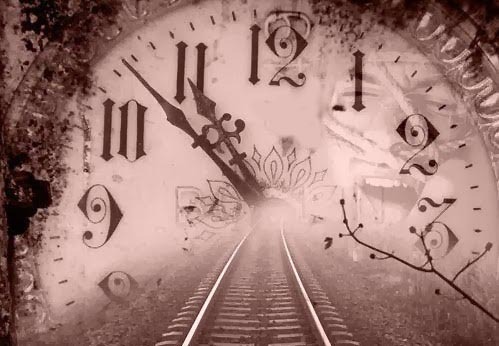 If time is an illusion, we are all time travelers on a journey to simultaneously experience endless events on different levels of conscious awareness. At this level our brains focus on the green screens of physical reality and react accordingly. Metaphysics, Dreams, and Out of Body Experiences take Time Travelers on consciousness journeys allowing the observer to tap into the flow of the collective unconscious or grids of experience. All of reality is about experiencing and evolving through the Holographic Universe in which we dwell.